This first round of funding is provided by the National Park Service and administered by the New York State Office of Parks, Recreation and Historic Preservation. Albany, NY - July 24, 2014 - Governor Andrew M. Cuomo today announced more than $5 million in awards to 14 historically significant properties that suffered severe damage from Superstorm Sandy. The funding will be used to assess, renovate and protect the landmarks so that they can be appreciated by future generations. "Some of New York's most treasured historic properties that have withstood the tests of time were battered by Superstorm Sandy and are now more vulnerable to extreme weather," Governor Cuomo said. "This funding will enable not-for-profit organizations and municipalities to better protect these important places so that they can continue to serve as educational and tourism assets for New York's communities." 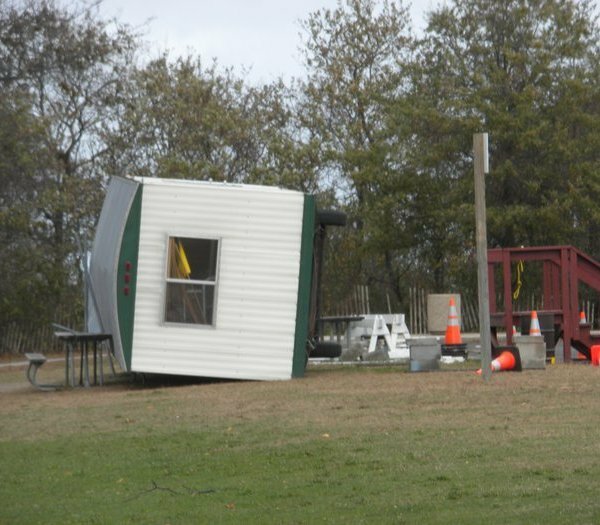 "Parks, cemeteries and historic landmarks are part of the fabric of their communities, and the damage they sustained was one of the many tragedies of Superstorm Sandy," Office of Parks, Recreation and Historic Preservation Commissioner Rose Harvey said. "Under the Governor's leadership, we are excited to be able to assist with this important aspect of New York's ongoing recovery from the storm." This first round of funding is provided by the National Park Service and administered by the New York State Office of Parks, Recreation and Historic Preservation. Grants are being made available to properties that are on or eligible for listing on the National Register of Historic Places, owned by municipalities or not-for profit organizations and located in one of 13 FEMA-designated counties. Work must meet the Secretary of the Interior's Standards for Treatment of Historic Properties and be pre-approved by the State Historic Preservation Office. Applications for a second round of funding, with an additional $5 million available, will be announced in the near future. Congresswoman Nydia M. Velázquez said, "This funding will go a long way toward restoring these historic gems so they may be enjoyed not only today, but also for generations to come." Congressman Joe Crowley said, "As the rebuilding efforts continue for the families and businesses affected by Hurricane Sandy, I'm pleased that those sites which are an integral part of our city's history are also being given the relief they deserve. I commend Governor Cuomo and the National Park Service for their commitment to seeing through New York's full recovery and making sure our historical landmarks will be around for generations to come." Congressman Tim Bishop said, "As we continue to rebuild from Superstorm Sandy, it is important that the state and federal governments work together to ensure that we not only rebuild and preserve our beaches and neighborhoods, but also those landmarks that are an important part of our heritage. These two properties are important pieces of the history of the east end of Long Island and I am glad that we are able to sustain them for the enjoyment of future generations." Congresswoman Yvette D. Clarke said, "For generations, Prospect Park has been a place of enjoyment for the families of Brooklyn, a place to share in the wonder of nature within the most densely populated city in the United States. As we continue to recover from the devastation of Hurricane Sandy, we must protect resources such as Prospect Park for the generations that will follow us in Brooklyn." Congressman Chris Gibson said, "As an advocate for our parks and historic sites, I am delighted this local landmark and tourist destination will be stabilized and repaired. Marine transportation helped make New York the Empire State, and the Saugerties Lighthouse is an important part of our cultural heritage. This is good news for the residents of the Hudson Valley and the many businesses that rely on tourism along the River." $168,000 to the Woodlawn Cemetery for the restoration of three damaged monuments, repairs to approximately 25 memorials and additional site work to remove storm debris. A National Historic Landmark, deemed by the National Park Service to have the "largest and finest collection of funerary art in the country," Woodlawn was established in 1863 and currently provides regular lectures and tours that contribute to cultural programming in Bronx. $950,000 to the Green-Wood Cemetery for cleanup, landscape and monument/gravestone restoration. Damage from Sandy was extensive due to the toppling of 300 trees; repair work includes restoration of three mausoleums and two gravestones, and landscape restoration/replanting. Developed in 1838 as one of America's first designed rural cemeteries, Green-Wood is a National Historic Landmark with one of the largest collections of significant funerary art and architecture. $715,000 to the Evergreens Cemetery for cleanup, landscape & monument/gravestone restoration. This rural cemetery, founded in 1849, has a significant collection of funerary art and architecture and is an important cultural resource and open space area in the community. It suffered severe damage from toppled trees crushing monuments and gravestones. $727,970 to the Prospect Park Alliance for the restoration and stabilization of the landscape in the heavily-wooded hillside area in the northeast perimeter of Prospect Park, known as the Vale of Cashmere. The Hurricane destroyed 50 trees, causing damage to adjacent structures and destabilization of the sloping landscape. The project will restore the woods, clean up storm damage, reset damaged boulder rockwork support, and replant native trees and shrubs in order to stabilize the slopes. $271,260 to Old Westbury Gardens for restoration of three-tiered plantings that create the South Allee, the most iconic view of Westbury House. The magnificent Charles II-style mansion is nestled amid 200 acres of formal gardens, landscaped grounds, woodlands, ponds and lakes. The South Allee was damaged by wind and salt, requiring total replacement of hemlocks and substantial replanting and restoration of dogwoods and lindens. $127,000 to the NYC Department of Parks and Recreation for a conditions assessment of damage to the NYS Pavilion cable roof structure to determine the impact of Sandy and develop cost estimates for stabilization; basic repairs may also be undertaken. The NYS Pavilion is listed on the National Register of Historic Places with national significance as a landmark of American engineering and was one of most highly acclaimed structures at the 1964-65 New York World's Fair. $350,000 to the NYC Department of Parks and Recreation for a conditions/engineering study and archeology survey of Waterside Bluffs in Conference House Park to assess the damage caused by Sandy and the exposure of important Native American and Revolutionary War artifacts at this National Historic Landmark archeological site. Any exposed archeological resources will be collected and treated and the area will be stabilized for future protection. $83,000 to the Staten Island Historical Society for preparation of an Historic Structure Report to assess the full impact of Sandy damage and to plan for remedial repairs and long term preservation. This ca. 1695 National Historic Landmark property served as a religious meetinghouse and residence and is considered to be the oldest schoolhouse in America. The property sustained severe flooding, damaging exhibition panels, electric and mechanical systems, artifacts used for interpretation and foundations, and possible structural damage. $52,360 to the Friends of Abandoned Cemeteries for retroactive and additional funding of tree clean-up and grave marker resetting at this National Register eligible site. $201,000 to the Caumsett Foundation for repair of sand dunes, sand trails, historic Plank Road and restoration of native plantings at Caumsett, the Gold Coast 1919 estate of Marshall Field. The project will include restoring the trail access to the coastal area and enhancing visitor access. $30,000 to the Town of Southold for clearance of dangerous overhanging trees/limbs above walking trails at the Downs Farm/Fort Corchaug Preserve. The site encompasses the Fort Corchaug archeological area, a National Historic Landmark designated Native American fort site that preserves contact period archeological deposits. $750,000 to the Town of Babylon for the repair and restoration of this former Coast Guard Lifesaving Station for continued use as a community center. Built ca. 1872, the structure sustained significant damage from Sandy and these funds will allow for full repair and restoration, including siding, windows and doors and interiors. $456,807 to the Town of Southampton for the first phase of work required to lift the boathouse 2' above flood elevation. The Town purchased the Colonial Revival style boathouse 10 years ago for use as an educational facility that will interpret the area's maritime history and provide access as a "trailhead" to the Peconic Bay/Conscience Point environmental/scenic and recreational area. $175,000 to the Saugerties Lighthouse Conservancy for stabilization and repairs to integral support structures, including the stone sea wall, the supply dock and concrete pier, all of which are critical to providing long term protection of and access to the resource. Constructed in 1869, the Saugerties Lighthouse is the oldest surviving lighthouse residence on the Hudson River and has become a popular destination, hosting interior tours throughout the summer. Subject: LongIsland.com - Your Name sent you Article details of "Governor Cuomo Announces $5 Million in Grant Awards for Historic Properties Damaged by Superstorm Sandy"